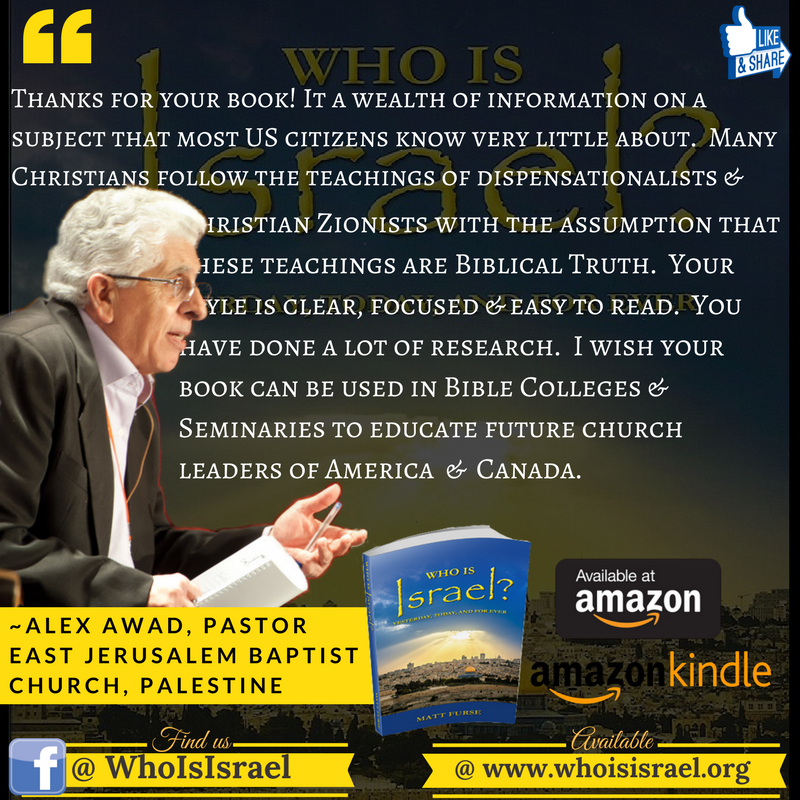 About the Author | About the Author – Who is Israel? 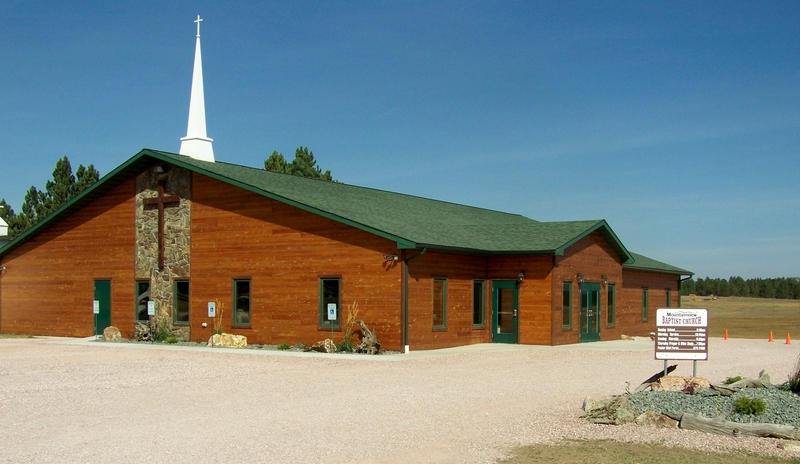 Matt Furse is the pastor of the Mountainview Baptist Church, in Custer, South Dakota. 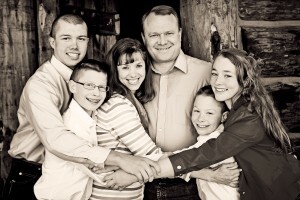 Matt is the son of a former pastor, and he himself, has been serving as a pastor for over 20 years. Although the subject of “Israel” and “end time events” are both very important issues to Pastor Furse, nothing is as important as his top priorities to both his immediate family, and his church family. 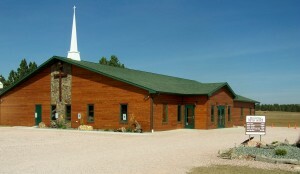 Visit the church’s website to see what he really spends most of his time doing! “Pastor Matt Furse has tackled a tough question and answered it based on scripture. The ‘Two Peoples of God’ doctrine of modern Dispensational Theology has come to dominate much of the evangelical Church in America. Many of those sitting in the pews have no idea that John Nelson Darby brought the doctrine here about the time of the Civil War. Pastor Furse has shown that according to Galatians chapter 3, the promise made to Abraham was made to Christ, and that Christians inherit the promise through Christ. 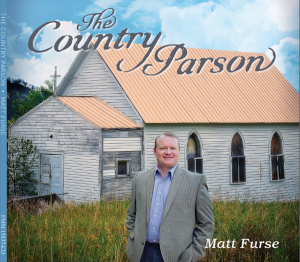 “Pastor Matt Furse, at one time I was a deacon in a conservative Bible Church. After I discovered that what we were hearing in Sunday School did not match up with what was in my Bible, I decided to find out who and when this teaching began. 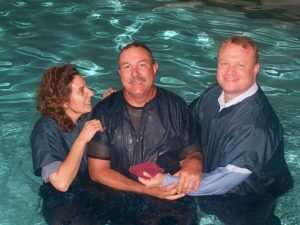 What I found shocked me and I wondered why our pastors were not telling us the origin of John Darby’s doctrine. I produced a YouTube video titled “Genesis of Dispensational Theology” that shows the origin of the Two Peoples of God doctrine. I am almost finished with a book which is related to yours, based on what I heard today on YouTube, during your interview with Texe Marrs. If you will give me an email address, I will send you the Rough Draft of the book for your review.” ~ Yours in Christ, Joe T.
“I stand with you Brother Matt, and I think there has to be more out there that do, and will stand with you! A Recent Email Message: “I love your comments on ‘marching to zion’, which I just watched on youtube, it help put my mind at rest that GOD Almighty continues to work in our mist through Pastors who stand firm in defense of CHRIST JESUS our LORD and SAVIOR. In spite of others who fly the flag of unbelievers in their mist and use words that are not in the HOLY BIBLE. May GOD continue to WALK with YOU always. Amen” ~ Michael L.
“Best book on the topic I’ve ever read. 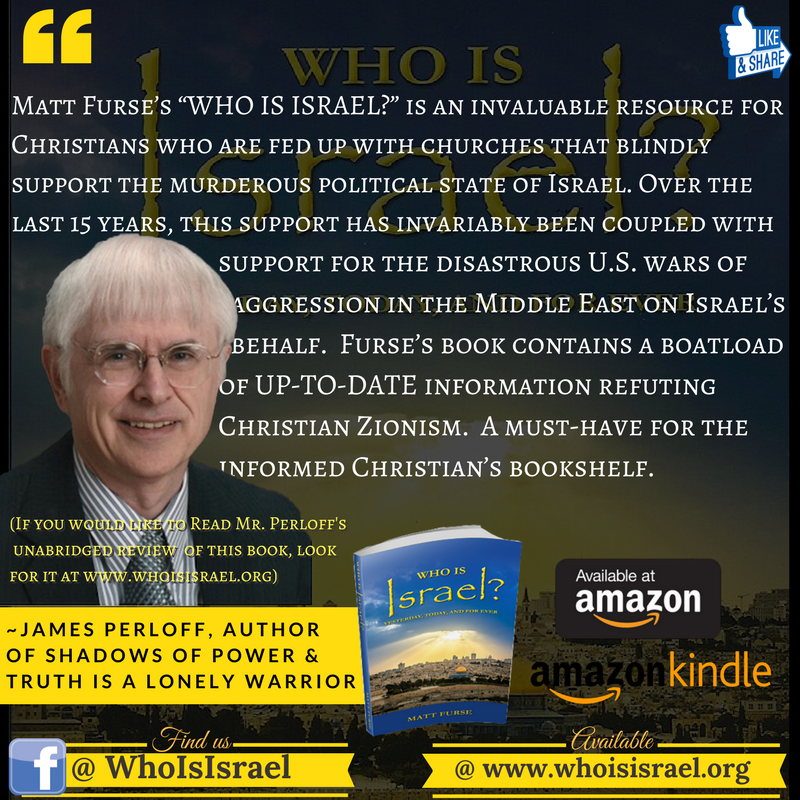 I’ve read it twice.” – Garrett C.
“Pastor Matt Furse wrote an excellent, clear, Biblically-sound book debunking Dispensationalism and Zionism, exposing Jewish fables and the treachery and terrorism of the so-called “chosen people” (most of whom ironically do not even believe in the Old Testament or the God of the Bible), and revealing who is the true Israel and who are the true Jews: the Christians. I found it encouraging and solidly founded upon reason, Biblical and secular records, and fact. May the Lord continue to bless him and his ministry.” ~ Troy V.
“It’s both sad and amazing that there are such a number of Christian doctrinal beliefs that are in so much error, confusion and ignorance when we are supposed to be walking in and led by Truth, especially the shepherds over God’s flocks…talk about twisted! But when you realize the deceiver is working overtime, since his time is short, it all makes sense as to WHY. To understand the HOW and what IS Biblically correct, use this excellent valuable research book (with helpful footnotes) written easily to be understood, that will help you break out of certain church deceptions pertaining to who really are the true biblical seed of Abraham? 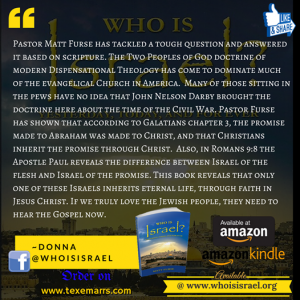 The biblical true Israel and who are they? Is the term “judeo-christian” biblical? What about dispensationalism? Also, the secrets as to how these errors even got into the church through a popular Bible’s “opinionated” notes and who was behind it, as well as bringing discernment to better understand who really is mystery Babylon and the whore in Revelation, and so much more is in here. We don’t have to be dumb sheep following group-thought ignorance anymore. Why would Jesus even have to say the “Truth will set you free?” Because He knew we would be born into the lies and believers would be buying into it without question. Also, Jesus mentioned about deceptions that would deceive the very elect if it could (and it is), and Paul also, about the great falling away from the faith was definitely going to occur. Let’s stop believing what we are told to believe, and be accountable to search out the scriptures and not be ignorant of God’s Word any longer, so we can run the race strong to the end and not get tripped up along the way. This book, with its Godly insight, Biblical revelations with the scripture passages to back it up, using discernment to expose the lies is a God-send for such a time as this! I strongly recommend this book to you to finally be set free in understanding more of the big picture, and see things from God’s perspective for a change…a change desperately needed!” ~ David K.
“One of the best written books about the TRUE Israel! If anyone will take the time to actually read it, the truth of the Bible will be seen throughout this book. It will make anyone stop and think about the subject of the end times and how the physical Israel will definitely play a major role during this time, but not the way that most Christians have been taught. You must read this book, if you are a Christian and want to know the truth! ~ David W.
“This book should be in the hands of EVERY member of CONGRESS and all ministers! It is EXCELLENT!!! !” ~ Charles P.